Calicut University Degree Third (3rd) Allotment Result published on 27-6-2018. The Third allotment result for degree admission under the calicut university colleges will be available at www.cuonline.ac.in. The Calicut UGCAP 2018 applied candidates who are waiting for 3rd allotment can check the third Allotment result from www.cuonline.ac.in by using their CAP ID and Password. The allotted candidates should remit the fee and report to the college from 27.06.2018 to 30.06.2018. The CU UGCAP Third (3rd) Allotment result 2018 published on university CAP site www.cuonline.ac.in. The candidates who are waiting for the allotment can check their result from the web site www.cuonline.ac.in. The candidates who got allotment in the Calicut University 3rd allotment result 2018 must have to remit the mandatory fee within the specified time to confirm their allotment and the seat for degree admission. After remitting the fee, candidates can download the admit card from the University CAP site and report to the collage for admission . and third allotment, shall take permanent admission retaining their higher options. Vacancies arising after the third allotment will be filled by the University through special/supplementary allotments. The candidates took permanent admission retaining their higher options and candidates not received allotment up to third allotment only will be considered for the above admission. Hence, the candidates received allotment and willing to be considered for the admission through special/supplementary allotments after third allotment shall take permanent admission retaining their higher options. 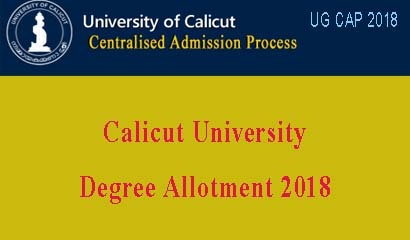 Calicut University Degree CAP 3rd Allotment 2018 Published.